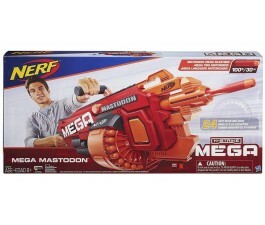 Check out the entire Nerf MEGA series of products, including Nerf N-Strike Elite Mega Cyclone Shock Blaster. Surely, your kids will have hours of fun battling with the Mega series high performance. Available at Mr Toys Toyworld. The Nerf Strike Mega series highlights the use of an updated Mega Dart type and features blasters that have firing ranges of up to a hundred feet (twenty-three meters). Blasters in this series have a red colour scheme and feature the ""Mega"" logo frequently on each's shell design. Find great deals on our range of Nerf Strike Mega Series. Visit our website, www.mrtoys.com.au and shop now! Available online or in our stores for your convenience.